Machines and plants are complex systems, in which a variety of drive and control technologies work together. Only when we look at the entire system can we see all of the opportunities for systematically increasing energy efficiency while at the same time maximising productivity. We have systematically bundled our experiences from being a manufacturer of the various automation technologies, a development partner for machine manufacturers, and a user of many different machines into Rexroth for Energy Efficiency. In the process, we have identified four levers that act across all technologies and applications and remain effective throughout the entire life cycle. 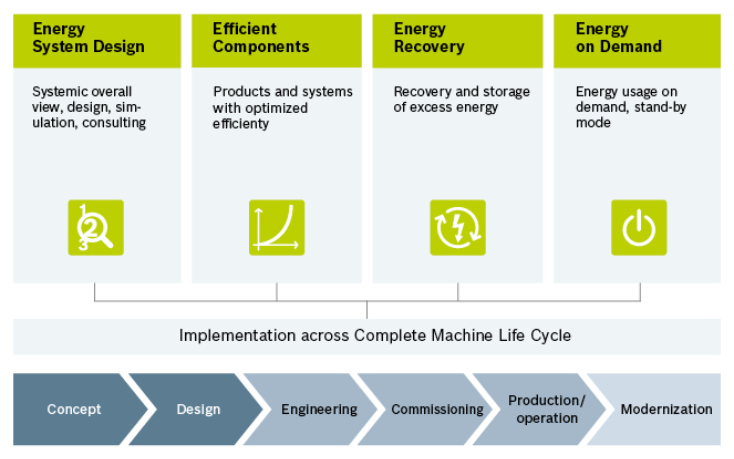 Increasing the energy efficiency of a machine is a task that relates to its entire life cycle, and Bosch Rexroth will accompany you at each stage. Machine manufacturers already lay the foundations in the concept development phase. More opportunities for increasing energy efficiency open up during the actual design, engineering and start-up of a machine or plant. After installation, Rexroth 4EE allows machine users to optimize the energy consumption even of older machines by making specific changes. Your plant is a complex system. For increasing energy efficiency, a decisive factor is therefore viewing your system as a whole – at the very onset, before you launch the detailed construction. Mechatronic simulations help you create the ideal design for your machine or plant from the very start. You will benefit from existing software solution concepts that allow energy consumption, cycle time, or air consumption to be analysed and optimised. Choose energy-efficient components or modules for each of your automation tasks: The Rexroth portfolio offers you everything from high-efficiency servo motors, decentralized drives, and axial piston variable displacement pumps to roller rail guides with low friction coefficients for components that work together perfectly. For instance, you can significantly increase efficiency with optimized hydraulic pumps. This lowers the fuel consumption and emissions of your mobile machines and commercial vehicles. Energy is too precious to be wasted. With accumulator charging circuits and electric or kinetic buffering, you can make use of excess energy in your industrial or mobile applications in a way that simply makes sense. High-efficiency servo drive control devices, for instance, allow you to recover braking energy. They can buffer the energy, make it available to other axes, or feed it back into the grid. We invite you to benefit from our know-how: Rexroth has strongly influenced and driven the development of solutions for the exchange of oscillating process energies – within and between the various drive technologies. Lower the energy consumed by your electrical and hydraulic actuators. Use controllers that ensure you consume only as much energy as you actually need – whether in factory automation, system engineering or mobile applications. Situational pressure control for all control principles, frequency converters for efficient speed controls, variable speed pump drives for reduced idle power, or on/off valves for energy switch-off during breaks - choose the solutions that make your machines and plants more efficient. Using the four levers of the universal Rexroth 4EE systematic approach will allow you to realise all potential energy savings: Across all automation technologies, applications, and the entire life cycle.